The transition from a Dark Star pub to being independently owned, marks another stage in the life of The Duke of Wellington. From its origins as a Victorian boozer, and some say brothel, hosting Shoreham harbour and boatyard workers, it reinvented itself in 1928 with a (John Leopold Denham) façade, incorporating Arts and Crafts design and more genteel interior. Like many other pubs, the early 80’s saw its interior ripped out with the loss of many features from the period. 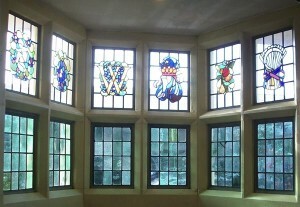 However, the stained glass windows (right) remain along with original plaster work. The open space was after all put to good use accommodating live music, and from 2006, this was combined with a plentiful supply of beautiful ales under Dark Star ownership. The next stage, under former Dark Star director Rob Jones, takes the pub towards creating its own booze. From the lingering possibility of a little brewery around the corner, to the tantalizing temptation of a distillery on site – there are many fabulous ideas for the future of the Duke of Wellington. As well as continuing upgrades and improvements to the pub, including Jess Green’s ongoing beautification of the beer garden.